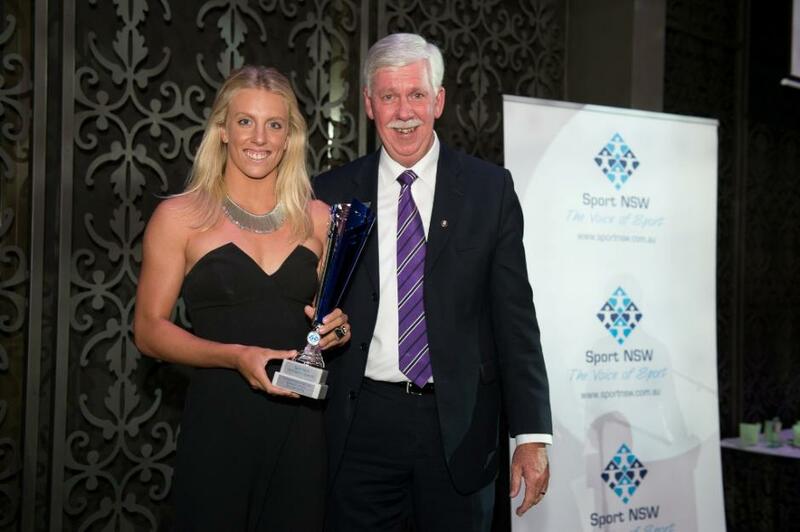 Newport SLSC’s Georgia Miller was announced as Sport NSW’s Young Athlete of the Year at an awards dinner at the prestigious Curzon Hall, Marsfield on Thursday evening (February 19th, 2015). Royal Prince Alfred Yacht Club sailors and Paralympic Gold Medallists Daniel Fitzgibbons and Liesl Tesch were awarded Team of the Year with a Disability at the same ceremony. This week’s announcements mark the 20th anniversary of Sport NSW’s Sports Awards recognising New South Wales’ leading athletes, teams, coaches, administrators, volunteers and organisations and celebrating their outstanding achievements in high performance and community sport levels. We spoke to Georgia on Friday to congratulate her and see what’s coming up for this talented lady. Congratulations on winning the NSW Sports Young Athlete of the Year Award last night Georgia – how did it feel to win? I was very excited. It was unexpected as there were so many great nominees, so I’m very happy to have won the award. You’re doing very well this year and will be going into the Ironwomen’s event in 2015? Yes, I just qualified for the Nutri Grain Ironwoman’s series, so that’s another big step. I’m heading in the right direction for where I want to go. I’ll be up at the States at Umina as part of the Newport team and then the Aussies (Australian Surf Life Saving Saving Championships) in April. What’s it like being part of the Newport Surf Club? I absolutely love it. They’re like a second family now, we all get along so well. Training is very hard but also very enjoyable. What would be your motto at present for keeping yourself focussed and performing at your best? At the moment I’m thinking that the hard work does pay off. When you’re not excelling in surf lifesaving sports, what are you doing – how do you balance your work life with your sports calendar? At present I’m doing a bit of nannying. This keeps my mind off training as you need to focus on who you’re looking after. I have also just started my Early Childhood Teaching Course through university. That work keeps my mind off training during the day and stops everything becoming too hectic and works well for focus when I do train. How many hours a week are you training at present? It’s usually two hours in the morning and three to four in the afternoon. We get Sundays off. Georgia competed at the 2014 World Life Saving Championships Youth competition and won a total of 10 medals. This included 8 gold medals in events such as the obstacle relay, medley relay and rescue tube race. Georgia also won 6 medals, including 2 gold medals at the 2014 Australian Surf Life Saving Championships. She won Gold in the U/19 Iron and U/19 board relay events. In the 2015 SLSA Interstates Competition held on Friday, 23 January 2015, and hosted by Newport SLSC, Georgia placed 1st in the Youth Female Surf Race – and 2nd in the Youth Ironwomen Results. Georgia was also Vice Captain of the NSW Team. Georgia also won the sixth round of the SIQS at North Burleigh on Saturday February 7th, her first ever win in the series. With her second placing at Freshwater and 5th at the Manly carnival this season, Georgia is over the line to be part of next season’s Nutri Grain Ironwoman series, even though there's one more round at Newport on February 28. Her Newport coach Trent Herring told her she had to become more aggressive with her racing and she certainly has. Georgia in action - SLS SNB Branch Championships 2015 - AJG Pic. The other Pittwater winners were RPAYC sailors and Australian Paralympic Team Gold medallists and 2014 World Champions Daniel Fitzgibbon and Liesl who deserve congratulations on being awarded Arthur J Gallaghers Team of the Year with Disability - Australian SKUD 18. Gold Medalists Dan Fitzgibbon and Liesl Tesch competed in the IFDS World Championships in Canada last August and won the Gold Medal for the Skud 18 event. This win qualified Australia for the Rio Olympics and helped Australia win the Nations Cup for the first time. This win also earned the team the Sailor of the Year with a Disability Award at the 2014 Yachting Awards.– Sailing See: www.pittwateronlinenews.com/danielfitzgibbonlieslteschwin-ifds-worlds-2014. “We’re very excited about receiving this award out of this high caliber group of athletes and congratulate all finalists on their achievements. It’s great to see our Paralympic sporting world continuing to grow and to have so many successful Paralympic athletes in our state and country,” five time Paralympian and four time Paralympic medallist Liesl Tesch said after being presented the award by Kim Thomson of Arthur J. Gallagher. Liesl and Dan at Halifax, Canada - image courtesy Australian Sailing Team, August 2014. Dan and Liesl have their eyes firmly set on defending their 2012 Paralympic Gold medal at the 2016 Paralympic Games in Rio de Janeiro. The pair most recently won the ISAF Sailing World Cup in Miami at the end of January 2015 as well as ISAF Sailing World Cup in Melbourne in December. Both are multiple Paralympic medallists and strong advocates of Paralympic sport . They are currently campaigning to get sailing reinstated in the 2020 Tokyo Paralympic Games after a recent decision of the International Paralympic Committee (IPC) not to include sailing on the Tokyo 2020 Paralympic Games sports programme shocked the international sailing community. The Australian Sailing Team news on this campaign also runs this Issue. 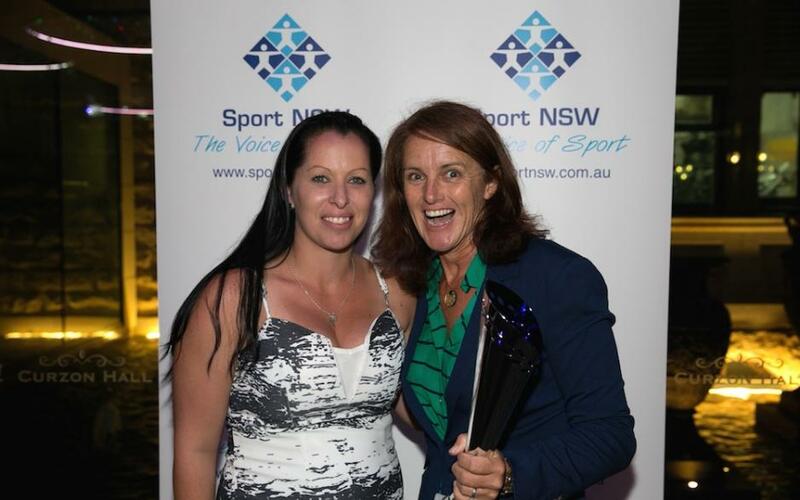 Sport NSW CEO, Cheryl Battaerd said the Sport NSW awards act as an umbrella to acknowledge the variety of sporting activity and achievement across the state in 2014. As a guide of the standard, the 2014 Professional Competition Team of the Year finalists included the NSW Waratahs, NSW State of Origin Rugby League Team, NSW Blues Cricket Team and the Western Sydney Wanderers. The finalists for the NSW Athlete of the Year were all women having excelled at an international level including; Jessica Fox - Canoe- Kayak, Stephanie Gilmore – Surfing, Emma McKeon – Swimming, Karen Murphy - Lawn Bowls, Dani Samuels – Athletics and Esther Qin – Diving. Six-time world surf title winner Stephanie Gilmore has been crowned 2014 NSW Athlete of the Year for the second time in four years at an inspiring awards night that also recognised coaches, administrators, volunteers, masters and young athletes and athletes and teams with a disability. Gilmore, who was a joint winner of the coveted title with sailor Tom Slingsby in 2010, was one of 19 winners across of variety of categories honoured at the 20thanniversary NSW Sports Awards dinner at Curzon Hall, Marsfield. Gilmore won three major international surfing titles in 2014 to edge out last year’s winner Jessica Fox (canoeing), Emma McKeon (swimming), Karen Murphy (lawn bowls) and Esther Qin (diving) in the battle for the top honour of Athlete of the Year. The A-League premiers and AFC Champions League heroes Western Sydney Wanderers won the 2014 Team of the Year (professional leagues category) in a hotly contested field which also included the NSW Blues, who won rugby league’s State of Origin series for the first time since 2005. The Sport NSW Sports Awards, first presented in 1994, recognise the leading NSW athletes, teams, coaches, administrators, volunteers and organisations and celebrates their outstanding achievements in high performance and community sport levels. 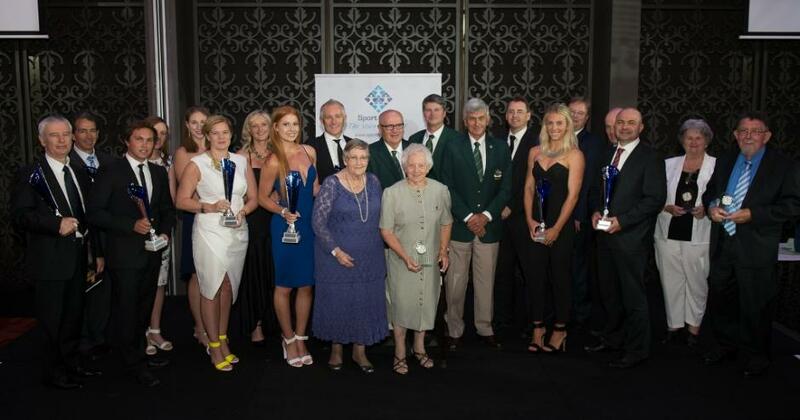 NSW based sporting organisations nominated athletes, coaches and leaders as well as distinguished long serving sport volunteers to ensure the NSW Sports Awards are recognising all levels in sport. This year’s awards attracted a star-studded field and more nominations than ever before in the 20-year history of the event. Stephanie Gilmore won three titles in 2014. These victories were at the Swatch Women’s Pro in Trestles, California, the Cascais Women’s Pro in Portugal and the Roxy Pro on the Gold Coast. Winning these events helped Stephanie secure her sixth ASP World Title since 2007. The 2014 World Title race was the closest in surfing history, coming down to the last day of the last event of the year at the Maui Pro. The 2013/14 season was the Wanderers’ second appearance in the A-League competition since they were founded in 2012. At the end of the season they finished in second place and reached the semi-finals. They also competed in the AFC Champions League, winning the knock-out competition by defeating Al-Hilal in the final, becoming the first Australian team to win the title. Bruce Dunbar, Kim Emery and Iain Yule all represented the Australian Pistol Team and are all from New South Wales. At the Commonwealth Games the team won Gold for the 10 metre Air Pistol event and Bronze for the 50 metres event. The IMSSU World Championships were held in July and the team won Gold in the Small Bore Handgun, Silver in the Field Pistol and Bronze in the Medal Standing event. Michael took over the coaching role of the NSW Waratahs in 2013, following a season where they finished eleventh. In 2014 he coached the team to their first ever Super Rugby Trophy, where they defeated the Crusaders in front of a record crowd. Following the Waratahs’ success, Michael was appointed Head Coach of the Australian Team, the Wallabies. Chava coached several athletes to success in 2014, which included six Commonwealth Games Medals. Two of the medals from the Commonwealth Games were Gold, achieved by Matthew Mitcham and Esther Qin. He coached Melissa Wu to her Gold Medal at the 2014 Puerto Rico Grand Prix, who also achieved a Bronze Medal at the FINA World Cup in Shanghai. Georgia Competed at the 2014 World Life Saving Championships Youth competition and won a total of ten medals. This included eight gold medals in events such as the obstacle relay, medley relay and rescue tube race. Georgia also won six medals, including two gold medals at the 2014 Australian Surf Life Saving Championships. She won Gold in the U/19 Iron and U/19 board relay events. Cricket NSW had a successful year on the field, winning the Sheffield Shield, Women’s National Cricket League, U/17 Male National Championship and the U/18 and U/15 Female National Championship. The Little Breakers League was established to introduce young girls to cricket, which has now been adopted nationally. Cricket NSW recorded an operating surplus of $3 million in the 2013/14 financial year. The Bingham Cup aims to eliminate homophobia in sport through a gay Rugby Union Tournament. The 2014 Bingham Cup in Sydney attracted 700 players in 30 teams from 15 countries which contributed over $4 million to Sydney’s economy and was a catalyst for change in Australian Sport. The Sydney Morning Herald ran 75 news stories on the event which was also discussed in international media. Matthew competed at the Brazil Championships and won four Gold medals for the 50 and 100 metre Freestyle, 50 metre Butterfly and 200 metre Individual Medley. At the 2014 Para Pan Pacific Swimming Championships in California, Matthew won the Gold Medal in six different events which included Freestyle, Butterfly, Individual Medley and Relay events. Sharon umpired her hundredth international game in 2014 at the Commonwealth Games, which also included officiating the Semi Final between New Zealand and Jamaica as well as the Bronze Medal match between England and Jamaica. Sharon is ranked Australia’s number one umpire and in 2014 she umpired her hundredth ANZ Championship game as well as her seventh consecutive final. Amy made her test refereeing debut in 2014, officiating a match between Scotland and Wales. Her performances led to her being selected to referee the 2014 Women’s Rugby World Cup in France. She later refereed the final in front of 20,000 fans. Amy was also appointed as an assistant referee in the 2014 Buildcorp National Rugby Championships in Australia, becoming the first female to achieve this. Nikki heads the Sports Development Team at Netball NSW, which consists of six metropolitan and five regional staff. Under her leadership the NetSetGo programme saw an increase in participation of 451% in twelve months. Similarly, boys participation in the NSW Schools Cup nearly doubled from 2013 to 2014 and there was also a 71% increase in the number of teams in the Oceania Netball Cup. Under David's guidance NSW Rugby League has implemented concepts such as the Knockout Health Challenge, which assists Indigenous communities with diet and exercise issues. The establishment of the high-performance training base for the NSW Blues in Coffs Harbour and the implementation of a new high-performance structure helped NSW win their first State of Origin series since 2005. John took over as chairman of Cricket New South Wales in 2013. Under John’s watch a new CEO and new Head Coach were appointed, the Sydney Sixers and Sydney Thunder enjoyed increases in attendance by 50% and Cricket NSW tripled its surplus budget. Sponsorship revenue from the Big Bash has trebled under his guidance and NSW have won their first Sheffield Shield in six years. In July Brett competed in the Laser Masters World Championship in Hyeres, France. At this event he won eight of the nine races, beating an international fleet of 116 in the Standard Masters Class. This gave Brett his ninth world title in sailing and his thirteenth podium finish. Media at the event described his performance as being "in a class of his own". Maddison competed in her debut Commonwealth Games in 2014. She made the final of the Women’s S8 100 metre Freestyle and won Gold in a World Record time of 1:05.32 at just 15 years of age. At the national championships in Brisbane in April 2014, Maddison won five medals including 2 gold medals for the multi-class 50 metre freestyle and the para-sport 100 metre freestyle. Defending Paralympic Gold Medalists Dan Fitzgibbon and Liesl Tesch competed in the IFDS World Championships in Canada last August and won the Gold Medal for the Skud 18 event. This win qualified Australia for the Rio Olympics and helped Australia win the Nations Cup for the first time. This win also earned the team the Sailor of the Year with a Disability Award at the 2014 Yachting Awards. Shelby is the Choreographer and assistant coach at Oak Flats Gymnastics. Oak Flats won two first place, two second place and two third place awards at the National Championships. At the State Championships, Shelby coached Oak Flats Gymnastics to four first place awards as well as one second and three third placings. Caitlin gained her Rhythmic Gymnastics Intermediate Judge and Men’s Intermediate accreditation in 2014. Throughout the year she officiated at state level events such as the Women’s Artistic Gymnastics SMC Gala Competition and Men’s Artistic Gymnastics Grand Prix competitions. Caitlin also marshalled at numerous state events including the Aerobics State Championships. Peter was the coach of the Telopea Amateur Swimming Club for 27 years and has contributed to the development of able-bodied and disabled athletes, as well as coaches. Peter was the Vice Chairman of the NSW Branch of the Australia Swimming Coaches and Teachers Association. At the 2000 Sydney Paralympic Games he coached Siabhan Paton who won six Gold Medals. Margaret has worked tirelessly for CPSARA since the 1980s. Her efforts have ensured that athletes with disabilities have opportunities to compete in national and international competitions. Currently serving as Vice-President, Margaret has also been on the board of the NSW Sports Council for the Disabled and was the chairperson of the Sports Advisory Committee to the NSW Sports Council for the Disabled. Margaret has been a member of the Dubbo Cycle Club for 38 years and held the position of secretary of the organisation for 26 years.Throughout this time she has heavily contributed to fundraising activities to support the club and its athletes competing at events both nationally and internationally. Margaret has also been hands on at cycling events throughout the state, as well as at the Dubbo Open Carnival. Since joining the Pony Club in 1981, Frank Kelleher has contributed significantly at both club and national levels within his 33 years in the Pony Club. Frank has contributed to a myriad of roles, having been a zone chief instructor, state championship judge, President of the Kurrajong pony club and is currently volunteering as the Vice-President of the Association. David’s roles within Yachting include being a board member of the Cruising Yacht Club of Australia, a board member and Vice-President of the International Sailing Federation as well as holding the position of President of Yachting NSW. Because of his commitment to Yachting, David was awarded the Beppe Croce Trophy by the International Sailing Federation, becoming the first Australian to do so. Marie has been involved with the Lismore & District Netball Association for 62 years. Her current role includes being the Vice-President and Representative Coordinator of the organisation. Marie helped establish the current home of Lismore & District Netball Association and as a result of her significant contributions to the sport of Netball and her community, the netball courts were named in her honour. The NSW Association of Canoe Clubs and Australian Canoe Federation were established in 1949 and Bruce (with his wife Joan) attended these meetings, enabling the establishment of both organisations. Bruce has since been the State President, officiated at the Sydney Olympic Games and ran junior development camps which resulted in paddlers achieving national, international and Olympic medals. After assisting the formation of state and federal bodies for canoeing, Joan was also involved in affiliating with the International Canoe Federation and International Olympic Councils. She was also responsible for archiving records and being a historian of Australian Canoeing and was awarded Life Membership to Australian Canoeing in 1992. Chris was a rowing coach at Sydney University, which began in 1979 and has since had various responsibilities within the sport, including being the President of Rowing NSW, the NSW King’s Cup Committee and the Sydney University Boat Club. Chris’ efforts have been imperative in helping to establish the Australian Boat Race, which began in 2010 and is now broadcast on television. Ted joined West Wallsend Football Club’s committee in 1963. Ted has helped the sport of Football by coaching and volunteering on match days and he is also a Director of the Lake Macquarie City Football Club. Ted was responsible for initiating a Footballers with Intellectual Disabilities programme at the club which began in 2010 and now has 24 players. Jan has always believed that people from all walks of life should be able to enjoy the freedom of horse riding. In her 34 years with the organisation Jan has contributed to numerous activities for the association including coaching, bookkeeping, organising workshops and successfully securing funding for a covered arena so people can enjoy horse riding in all types of weather. Margaret became a tennis umpire in 1980 and has devoted her time to assist tennis players and officials. She was the Assistant Secretary of the NSW Tennis Umpires Association, later becoming a board member. Margaret has officiated at the Australian Open, Hopman Cup and NSW Open. Margaret has been responsible for mentoring international tennis officials, including umpires of Grand Slam Finals. Ted has had many roles in the sports industry for over 50 years, including working as an announcer, referee, journalist, board member and a historian. Ted’s commitments spanned across sports including Basketball, Football, Tenpin Bowling and Athletics. Some of the awards he has received include being elected into the Australian Football Hall of Fame and receiving an Australian Sports Medal. Larry's affiliation with Rugby began in 1970 when he played his first university game in Armidale. Since this time he has the secretary and president of the Gosford Rugby Club. Larry has also been a board member of Central Coast Rugby Union since 1998 and is now the President. In 1999 Larry helped to establish a women's competition on the Central Coast which ran for eight years. Graeme has volunteered with Wheelchair Sports NSW for 31 years. In this time he has been a board member and the President and has also been the President of Wheelchair Sports Australia. In 1983 he helped conduct the inaugural Junior Wheelies Christmas Camp in Lidcombe, which is still running. In 1987 Graeme established the Australian Wheelchair Tennis Association.